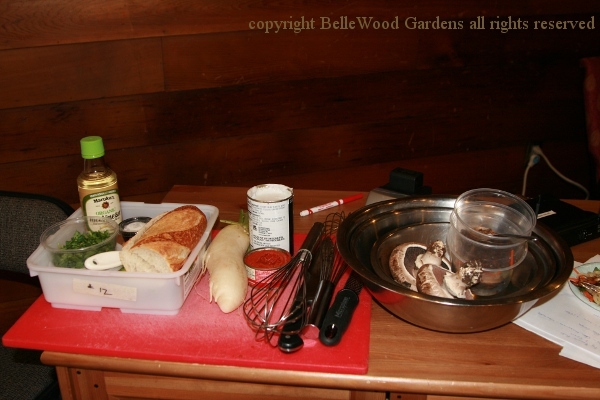 Every February the New Jersey Mycological Association has its annual mushroom cooking demonstration and tasting. We're fortunate in that once again Luke Smithson, executive catering chef Jamie Hollander Gourmet Food, will be our presenter. He joined the NJMA for his own fondness for mushrooms (which he goes foraging for himself.) We've lucked out that today is sunny and mild, a welcome aberration in the bitterly cold and snowy weather we've been enduring. And thanks to Phillips Mushroom Farm we're in good shape for mushrooms. Each Mcophagy event is limited to members only, with a maximum of 80 attending. There's a theme of one sort or another. This year it is based on recipes from one of the books reviewed in the NJMA newsletter - chef and cooking teacher Becky Selengut's Shroom: Mind-Bendingly Good Recipes for Cultivated and Wild Mushrooms, published by Andrews McMeel Publishing, 2014. Her book explores 15 types of mushrooms and 75 internationally-flavored mushroom dishes. 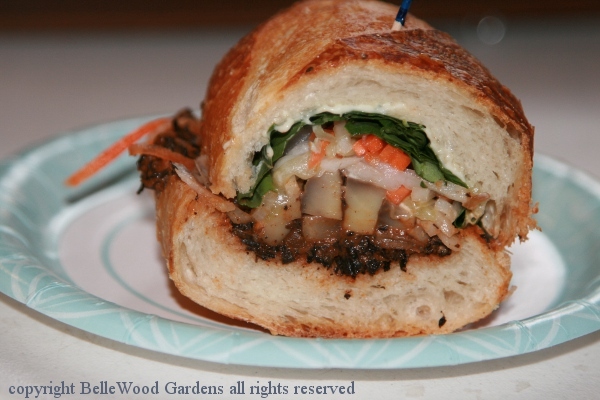 Luke and the culinary group committee chose two Vietnamese dishes - shiitake noodle salad with nuoc cham and herbs, and bahn mi sandwiches with red curry roasted portobello mushrooms and pickled vegetables. Wonderful combinations of hot and cold temperature foods, raw and cooked textures, spicy and sweet flavors. In addition to mushrooms the dishes include spicy chilies, fermented / pickled vegetables, and soft herbs such as basils and cilantro. There's a lot of prep work going on behind the scenes in the kitchen. As well as the live demonstration in front of the audience there are the generous samples to be handed out to the audience. 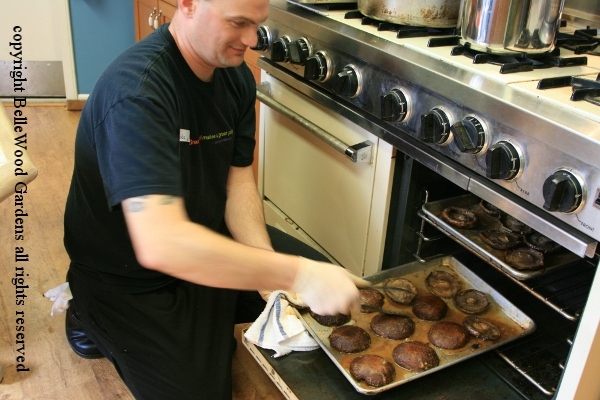 Luke is busy roasting the portobello mushrooms for the bahn mi sandwiches. They've been rubbed with a mixture of coconut milk, red curry paste, and fresh lime juice. Coat the cleaned mushroom caps (stems removed and gills scraped out) with the marinade and roast in a 400 degree Fahrenheit oven for about 15 minutes, flip, and roast for 5 to 10 minutes more on the other side. 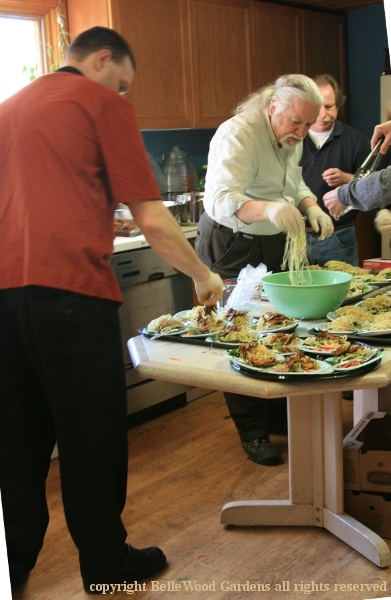 Luke and the usual volunteers are busily plating up the shiitake noodle salad. Place lettuce torn into bite-size pieces on the bottom of 4 bowls. 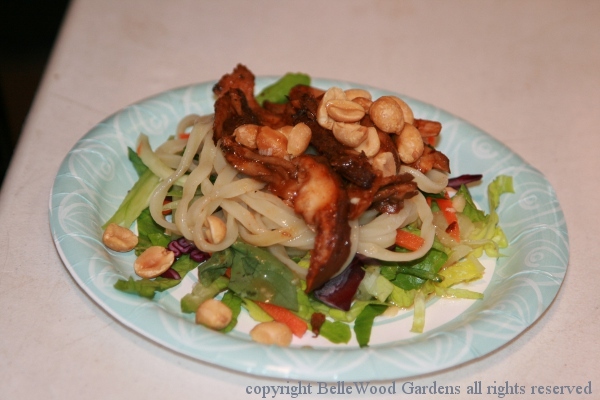 Top with room temperature noodles. Add finely julienned carrots and cucumber. Whisk together 1 Tablespoon tomato paste, 2 teaspoons soy sauce, 2 teaspoons seasoned rice vinegar,2 teaspoons toasted sesame oil, 2 Tablespoons coconut oil, freshly ground black pepper, and 1 teaspoon porcini powder. Mix all together and toss over one pound of shiitake mushroom caps. Hands work well to do the mixing. Grill, gill side down, for about 5 or 6 minutes. Flip, and broil for an additional 3 to 4 minutes until caramelized. Slice. Reheat in a skillet or hot oven just before plating up. Scatter some peanuts over everything, along with fresh basil. Accompany with nuoc cham sauce - lime juice, fish sauce, sugar, chilies, garlic, and some water. Staging for the bahn mi demonstration. Piled onto some wonderful French bread (with a little of the soft center removed so there was room for everything piled in / on it) - fine julienne of cucumber and carrot, tossed with seasoned rice vinegar, red curry roasted portobello mushrooms, some fresh basil and cilantro, spicy lime mayonnaise spread on one side of the bread and black trumpet mushroom pate spread on the other. And for dessert (you didn't think we'd skip dessert now, did you? Nah. But I'll bet you didn't think there'd be mushrooms in the dessert.) 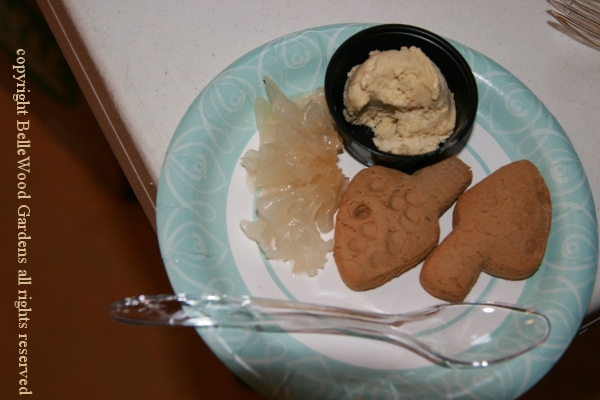 Green tea and candy cap mushroom ice cream (adapted from Food52) with candied snow fungus and gingerbread cookies. Wonderful event, just delicious. And mushrooms from beginning to end.